It’s February and that means it’s the month of Miss Sparkly Paige. Our tradition as we roll past the holidays and into the new year is to begin the planning of our next epic birthday party theme to celebrate our fabulous Paige. Over the past several years she has become a Pinterest queen just like her Mama. She dives into the Pinterest world looking for her next big creative inspiration. This year she decided to go with her favorite movie and animated characters- Minions. And I have to say I was excited to build this party out. I mean who doesn’t love these adorable, funny, happy little characters? 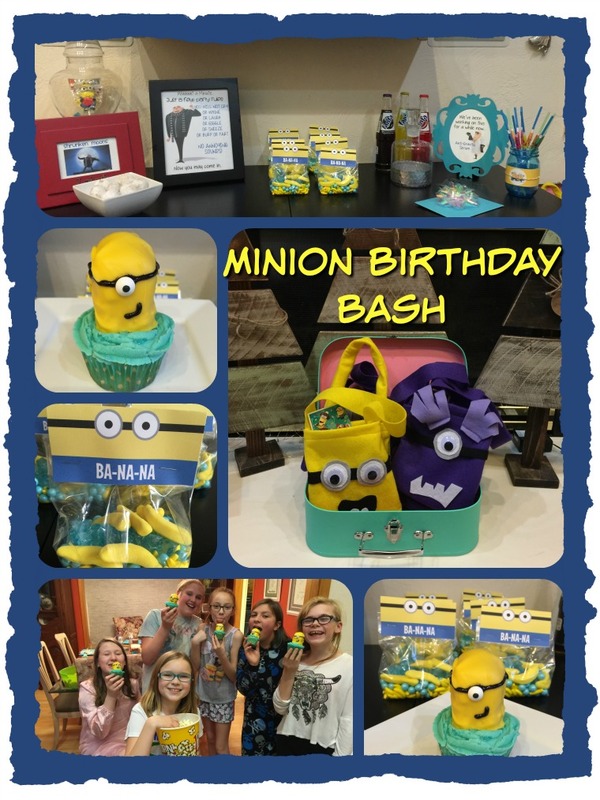 Their upbeat, super fun attitude was perfect to celebrate Miss Paige’s 12th Birthday. Invites set the tone for all the glorious fun to be had. We had fun perusing through all the great invite ideas and options. We settled on one we could easily adjust and make for our selves thanks to Dawn Nicole at DIY Design Den. She has these adorable printables that were super easy for me to go into Photoshop Elements and add our details. The invites were perfect! We also used the water bottle printables for our mason jars to hold our umbrella straws and utensils. 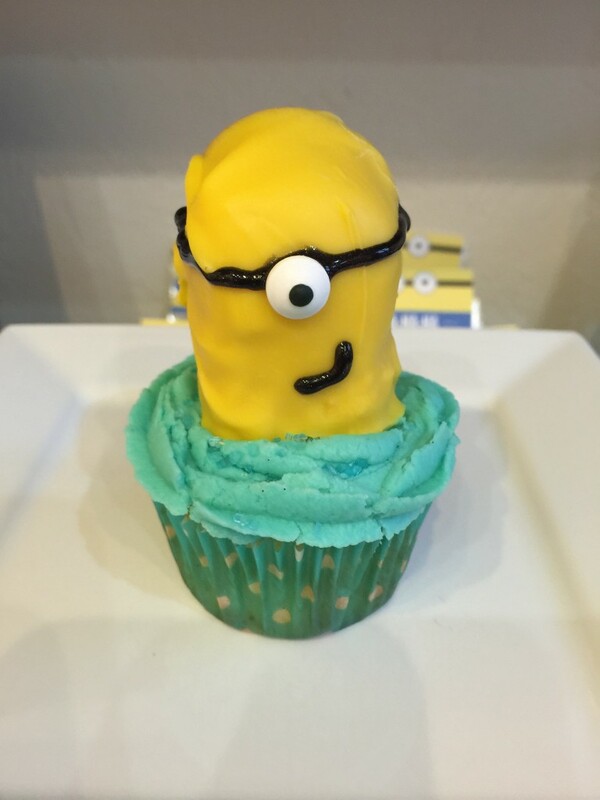 We always look for one crafty project and of course a super cute and yummy cupcake. 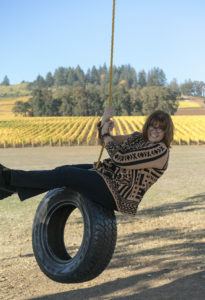 The inspiration on this theme was wildly plentiful! 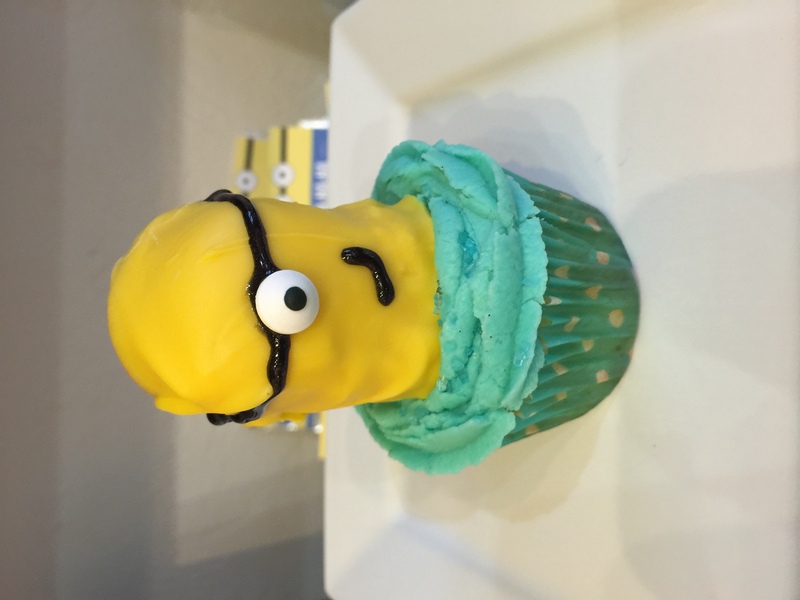 We found a ton of fun ideas for the cupcakes, but zeroed in on using Twinkies to create Minion toppers and an extra treat too. You can never have too much sugar can you? We made my favorite Ultimate Vanilla Cupcake recipe from The Cupcake Project with the vanilla bean buttercream frosting. The cupcakes are moist and the vanilla flavor is out of this world. They melt in our mouth. I have to say honestly, these make the absolute yummiest vanilla cupcakes ever! I have tried a million vanilla cupcake recipes and this is hands down the very best out there. The cupcake project also has a chocolate cupcake that is to die for! We found awesome inspiration for our design from Inspired Dreamer. Paige and I came up with the idea to dip the Twinkies in yellow melting chocolates we picked up from JoAnne Fabrics to give our little guys a more authentic, yellow look. And everything tastes better dipped in chocolate right? It was a bit tricky to get them dipped and smooth. I think our final product came out super cute and the girls LOVED them! So much so they took selfies with them-guess that is the official sign of success in this day and age. LOL! 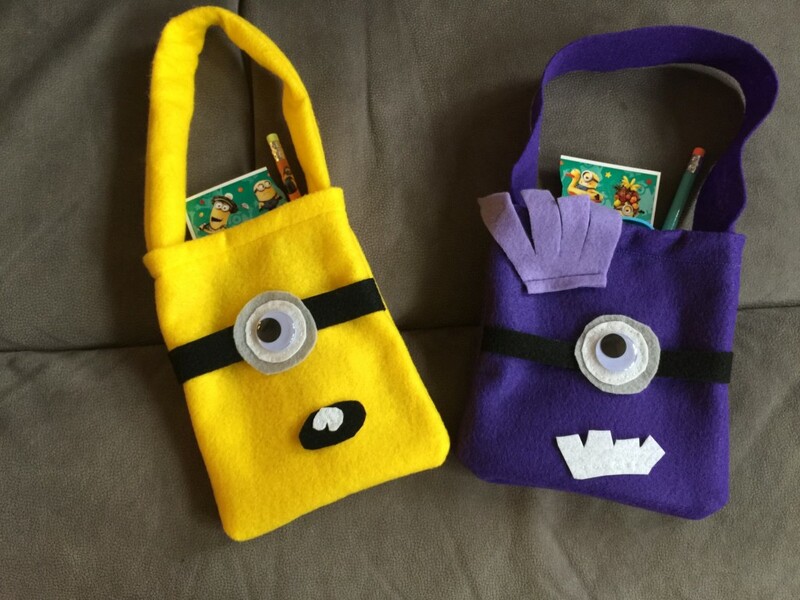 Our crafty project was to make felt goodie bags that looked like minions. We got the idea from an Etsy site. If you don’t sew it’s a great option, but this is one of our favorite things to do together so Paige and I set off to create our own. They were fairly simple to make and I think they came out great. Again the girls were over the moon excited about the bags and kept asking if they got to take one home. That sure makes a Mama’s heart happy! *The amount of felt will depend on how many bags you are making. We did 5 of each with 1 yd of felt and had a ton left over. We bought 2 sheets of square felt for the black, grey and white and also had plenty to make our bags. Cut the bags in a square shape about 7” wide by 8” high. Cut the straps 1 ½” wide by 16” long from black felt. I used a couple of my circle punches to make circle stencils to cut the white and grey for the eyes. For the mouths we played with different shapes and sizes. The purple minions we just did white teeth and the yellow ones’ black mouths with white teeth. Fold the top of the bag over 1” and sew a ¼” seam to create a finished edge at top of the bag. Place the black google strip in and pin in place. Add one or two of the eyes with white circle on top pf grey felt circle and hand stitch into place. Place mouth and teeth pieces and hand sew into place. Place purple hair pieces for purple ones and hand sew in place. Attach strap to rough edge of the bag without the face pieces and sew on top of finish seam so you can’t see the extra stitching. Place front and back pieces of the bag finished sides together and stitch a ¼” or a bit wider seam. Turn bag right side out and glue the googlie eyes onto the eye felt piece. Emilie at Baby Loving Mama gave us the inspiration for fun goodies for our treat bag. Her printables were so stinking adorable and super easy to make. She gave us lots of ideas for treats inside and were were able to find them at a local candy store. If I had been more on my game I would have ordered online since we also found some great treats at Oriental Trading Company.